Loves Rubberstamps Blog: Lace and Pearls and Spring Colors! Sorry for the late post today, we were having internet issues - GRRR! It seems like our internet provider knows exactly when I have tons of stuff to get done online! Today is Tuesday and this is an extra special Tuesday for me because this is my FIRST challenge inspiration project for Crafty Sentiments Designs since being chosen for the Design team! Their challenge this week should have some gorgeous, gorgeous entries because it is Lace and Pearls! 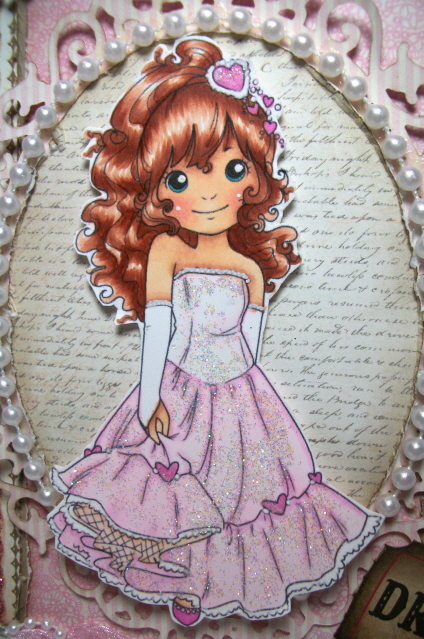 Now to me... nothing says Spring has arrived like Prom and this image totally reminded me of a girl all dressed up to go to her Prom so I made my colors be soft pastels which reminds me of Spring...so I also used this project as inspiration for our Loves Rubberstamps Challenge this week - Spring Colors! So I hope that you will play along with us at Crafty Sentiments Designs by adding Lace and Pearls to your project and if you use Spring Colors also - play along at Loves Rubberstamps too! 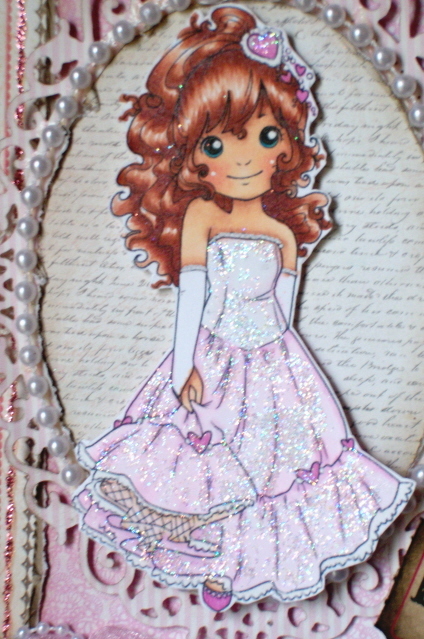 Fabulous card Laura, love the coloring job and all the details on your card, love the bling! Awesome job! Congrats on being selected to Crafty Sentiments Design Team!! Oh she is so beautiful, love the spring colors and the fabulous design and your coloring is perfect. OMG this is sooooo Gorgeous!!! I LOVE all those pearls on here!!! Congrats on joining the DT also!!! What a lovely card! So pretty! I feel your internet pain :) and like you say, always when you have the most to do! Love all of your beautiful pearls, lace, and sparkle, and congrats on your new DT assignment! Thanks for joining us for our April challenge at Oozak! Congrats on the new design team! She is just beautiful! I love how you colored her hair! Stunning card, lovely image and beautiful layout. Thanks for sharing with us at Sparkles Monthly. Adorable - LOVE all that sparkle on her dress!! Cute ticket with "dream" on it - very creative! What a sweet card! I love how you colored the girl, especially the hair. wow! I love it! Thank you for joining us at the Oozak Challenge! Wow....absolutely stunning image. The nestie die and pearls around it are gorgeous. Thanks for joining us at LCI Challenge this fortnight.